Chapman easily took the Men's four-wall opens. The Saturday evening awards ceremony capped off the week's activities. 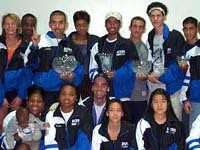 Members of the one-wall contingent at the 2000 World Championships. Over 800 handball players from 8 nations participated the 2000 World Handball Championships held at the Lattof YMCA in Mt. Prospect Illinois. The event included more than 2,000 matches in 75 categories of play, ranging from the Girls 13 and under to the Men's 80 and over competitions. The World Handball Championships occur once every three years. The last one was in Winnipeg, Canada in 1997, the next one will be in Ireland in 2003. The tournament showcased the sportsmanship and strong bonds between the game's long time players. In addition, young players find the event not only as a key venue in which to hone their competitive abilities but also a wonderful opportunity to take an exciting trip and meet people from around the world. For many, the singing and socializing in the hotel halls after the Saturday night banquet dinner will be as memorable as some of the great games they played or watched. The semi-finals were the high-point in the men's four wall opens, as two young Irish players provided stiff competition to the top ranked Americans. 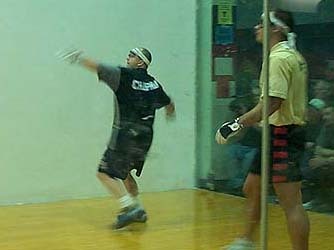 David Chapman, the sports dominant player, faced a determined Tony Healy before winning 21-15, 21-17. In the other semi-final, former World Champ John Bike was pushed to his limit by Paul Brady. Bike finally prevailed 18-21, 21-12, 11-8 however the competition was so intense that his legs could not recover in time for the following day's showdown against Chapman. Bike scored a total of only 7 points in the entire finals match. 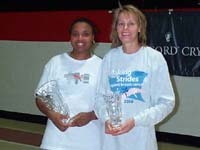 Priscilla Shumate capped an incredible year by winning the women's four-wall singles. Chapman then teamed up with Danny Bell to defeat Bike and Kendall Lewis for the men's open doubles. Priscilla Shumate defeated Anna Christoff in the final, 21-13, 21-16. The victory was the piece de résistance for Pricilla's incredible year, having already taken the championship in the four-wall, one-wall and three-wall women's pro divisions. Christoff and LeaAnn Martin took the women's doubles event. In the one-wall men's open singles, Cesar Sala and Joe Kaplan, two Brooklyn boys and good friends battled it out in the finals. Cesar prevailed 21-11, 11-21, 11-6. Tony Roberts and Dave Rojas, 1997 one-wall winners were able to maintain their title as champions by easily defeating Paul Williams and Eddie Maisonet 21-6, 21-7. Williams and Maisonet did not appear to be fully recovered from their tremendous semi-finals match against Kendall Lewis and Joe Kaplan. In a game filled with long volleys and spectacular diving saves, Williams and Maisonet were down 10-5 in the tiebreaker but came back to win 11-10. New York players also dominated the women's one-wall events. 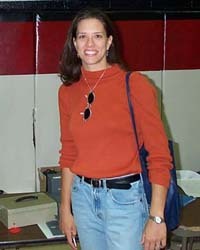 Karen McConney defeated Dori Ten 21-10, 21-7 to take the women's singles crown. 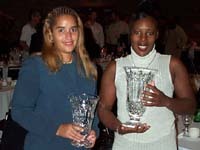 However, Ten and her long time partner, Barbara Canton-Jackson, took revenge by defeating McConney and Sydell Smith the former women's singles champion in an 11-6 tiebreaker to take the one-wall double's finals. For more information about these and other competitions see the USHA site.